A riddle that will blow your mind. Can you solve it? 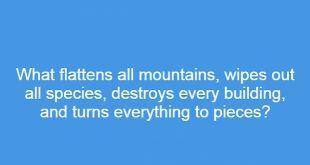 The question that you need to answer is: What flattens all mountains, wipes out all species, destroy every building, and turns everything into pieces? I stink when living and smell good when dead?